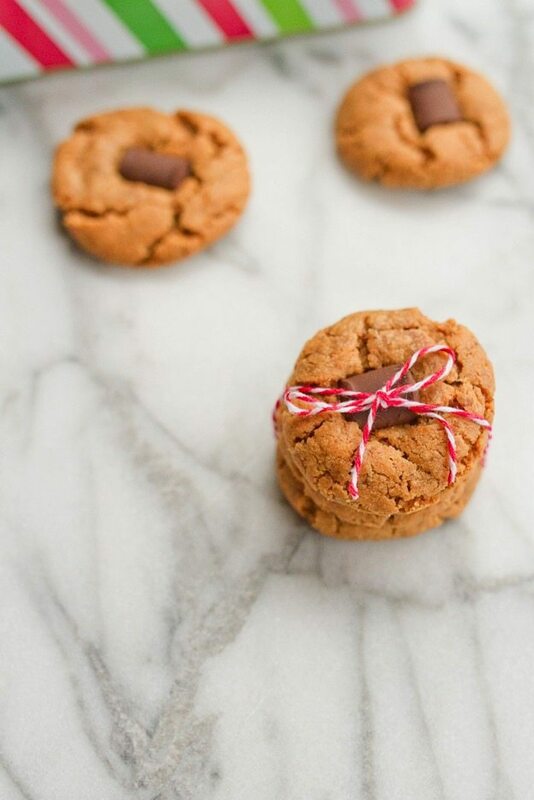 With only six ingredients and about 15 minutes to whip up, these flourless vegan peanut butter blossoms are an easy addition to your holiday cookie tray! Vegan and gluten-free. I can’t let the holiday season pass us by without posting another holiday cookie recipe. My family and I have a thing about holiday baking and it just wouldn’t feel right not to whip a few Christmas cookies this month. I hope you don’t mind! These cookies are basically my take on peanut butter blossoms (you know, the ones with the Hershey’s Kisses). And I have to say, they’re just as good. Maybe even better! They still have the delicious peanut butter and chocolate thing going on, I just used Enjoy Life Mega Chunks instead of Kisses. I haven’t nothing against Kisses (especially the ones with almonds), but I’ve never been a huge fan of having to deal with the pointy Kiss while eating my cookie so the flat chocolate chunk actually works out better. Plus, I’m a big fan of Enjoy Life’s baking products because they’re vegan, gluten-free and soy-free. I use their chocolate chips all the time! 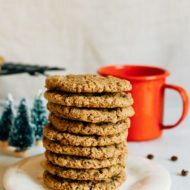 Everyone who has tasted the cookies has loved them and would never guess that they’re vegan, gluten-free and only require a few ingredients and about 15 minutes to make. 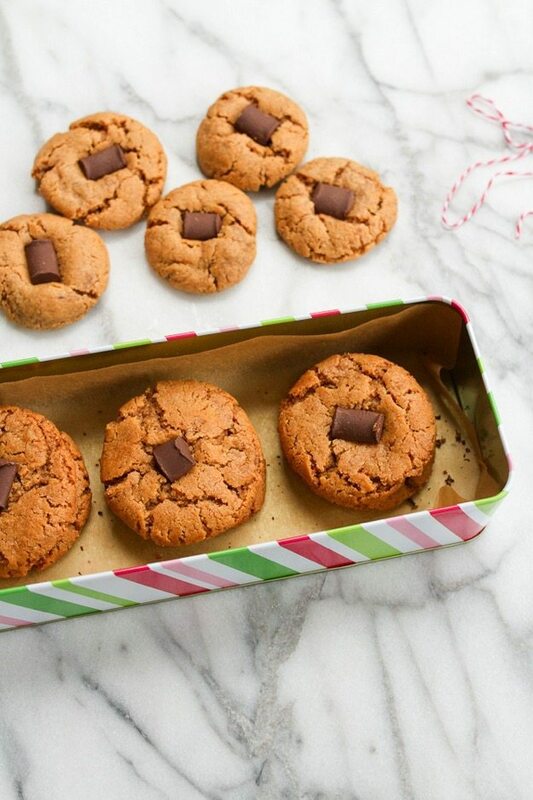 They’re definitely a great addition to any holiday cookie platter. I hope you enjoy them as much as we have! 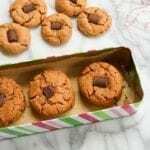 If you make these flourless vegan peanut butter blossoms, please be sure to leave a comment and star rating below. Your feedback is super helpful for the EBF team and other readers who are thinking about making the recipe. Mix together the ground flaxseed with the water to make your flaxseed egg and set aside. In a medium bowl, mix the peanut butter, sugar, flaxseed egg, vanilla and baking soda until well combined. Spoon 1 Tablespoon of the mixture, roll into a ball and set about 1 inch apart onto ungreased baking sheets. Bake for 9- 10 minutes. Remove from oven, and immediately press a chocolate chunk into each cookie. Allow to cool completely; the chunk will harden as it cools. If you don’t need the cookies to be vegan, you can use a regular egg instead of a flaxseed egg! Making these asap! Love the vegan variation. Perfect. These sound like a winner for sure and super easy! 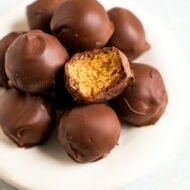 I agree, you can’t go wrong with chocolate and peanut butter. I’ll have to check for those chocolate chunks at my store. Omg I make these every year for Christmas and will be trying out this recipe! I can wait =0) Just a quick questions, are these soft a chewing? The ones I normally make are soft and chewing as it takes unsalted Butter. I want to hear more about this sugar detox! Yum! Definitely making these this weekend! I used to make these as a kid!!! With Hershey kisses in the middle! So cute! These look delicious. I have a 3-ingredient peanut butter cookie recipe I love (flourless) so if you ever want to try that to compare, let me know! I have a hunch these would be as delicious as a non-vegan competitor. Delicious! These look fantastic! Do you think it would work with a regular egg instead of flax egg? Thanks! 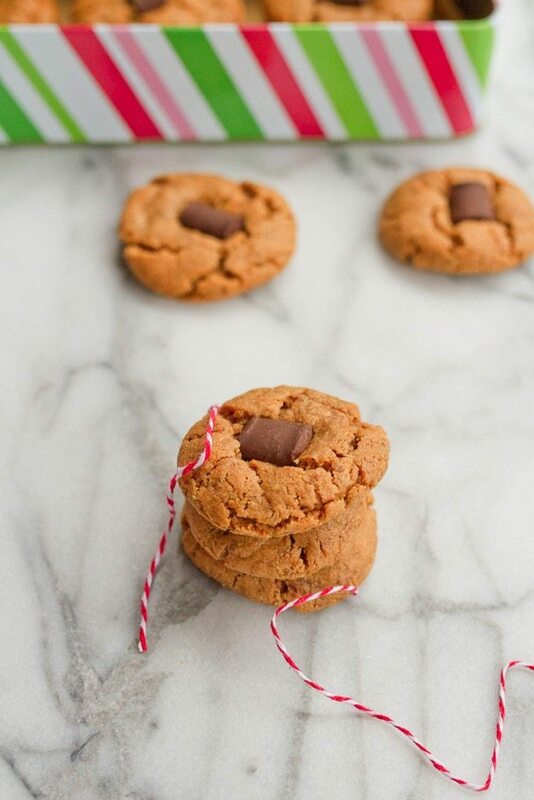 I’ve never been able to resist the old standard chocolate and PB combination, especially in cookie form, and even more so when they’re this easy! They look amazing, Brittany! 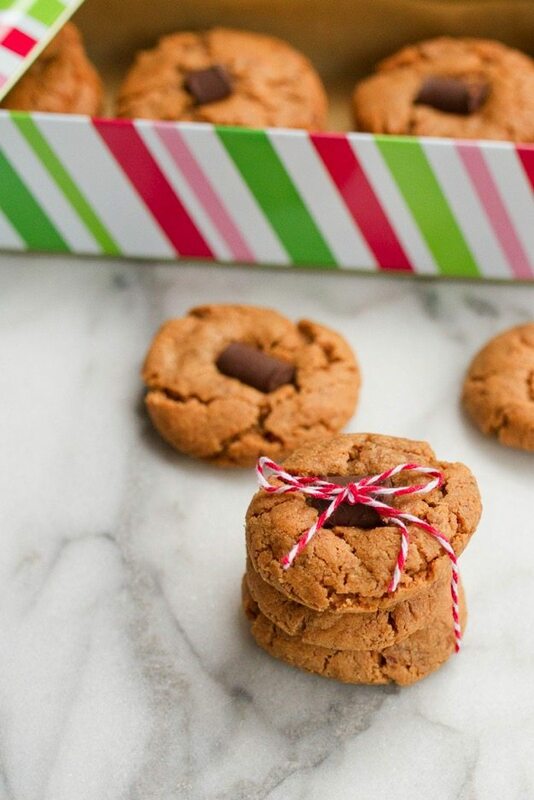 Love that you flipped the classic peanut butter blossoms! And congrats on finishing your 10-day sugar cleanse. Sugar is so hard to stay away from. I once eliminated all types of sugar (sucrose and fructose) for 14 days and felt like a serious addict until after a week. Oh man! That would have been really hard without fruit or anything! Did you go right back to eating sugar after cutting it out for the 14 days or have you been eating less since the detox? Considering the minimal amount of ingredients called for, these came out alright. 🙂 They have the texture of a no-bake cookie and though most of them unfortunately fell apart when picked up, there weren’t any leftovers after the potluck I took them to tonight. I probably wouldn’t make ’em again but I loved how simple they were to whip up! These are so good! I halved the recipe and only used 6 tbsp sugar, 3 brown and 3 white. I also added a sprinkle of salt. They taste great with coffee and ginger tea. Thank you!!! These are the best pb cookies I’ve ever made. I’ve made pb cookies using JIF natural pb and white sugar and they were excellent albeit a little fragile. This time I used Skippy natural pb because my boyfriend bought the wrong stuff – and used light brown cane sugar because he also bought the wrong sugar. I also did 1.5 times the recipe with 2 full flax eggs and maybe a bit extra vanilla. I rolled them in small balls and then in white sugar and pressed them with a fork on parchment paper – baked at 325 for about 8 to 10 minutes (my oven burns cookies at 350 it seems….) until puffed up and a shade darker – when I pulled them they were still very very soft. I let them cool on the cookie sheet. The cookies were about the size of a fifty-cent piece – maybe a little bigger. The end result was a SOFT CHEWY cookie. I skipped the chocolate. But OMG they were amazing and not fragile. I have no idea why they turned out so much better – I’m not a baker/cook but maybe the light brown sugar made the difference – with a little extra flax egg? I don’t know. The lower temp and letting them cool on the cookie sheet maybe too? I can’t imagine using a slimy egg though – highly recommend the flax egg. 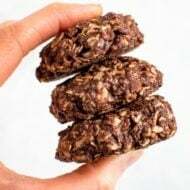 OMG – I made these and because I’m gluten and dairy-free I was looking for a healthy replacement for my Mom’s cookies that are like these. These turned out soo yummy. Great recipe and love this site. These are delicious, soft cookies. I ran out of peanut butter, so I used half peanut nutter and half cashew butter. My friends loved them too.